Let's Listen - DOUBLE FEATURE! Fingerpick by Realitone and select Misfit instruments by 8Dio! Hey all! Welcome to the Wild West themed 'Let's Listen'! Anyone who knows me or has worked with me professionally knows I thrive on variety and having a wide and eclectic musical taste, which translates into covering a lot of ground as a composer and musician. Every month I try focusing on covering new musical ground... and once again it's time to expand! When you stop exploring and learning, life can quickly become quite.. boring. My listening focus lately has been on exploring the roots...ethnic music from all over the world (specifically China, Persia, and India, so stay tuned for more of that) and here in the USA, which brings me to today's feature! I love the Western film/video game genre and American roots music as a whole, and have always wanted to explore more into this territory with my own music. I did a few things here and there experimenting, but my libraries were severely lacking. I know the blues well on guitar and a bit of country but wanted to have EVERYTHING... fiddle, banjo, harmonica, that epic whistle you hear in the old Clint Eastwood films (listen below to "The Good, The Bad, and The Ugly"... that intro whistle is unanimously associated with Westerns, and we ALL recognize it). Do you feel lucky? Do ya, punk?! Wrong film, whatever. I settled on the Misfit series from sample giants 8Dio They are priced VERY modestly (I paid $15-$37 for each) and I was swayed by the demos and their unique sense of charm (from the official site: "8Dio's Misfit Series is a massive deep-sampled collection of over 15 different instruments – all recorded with a unique, quirky and semi-drunk feel to it." I started with the harmonica and banjo to get a feel for the usability and quality and later returned for the fiddle and whistle (I was torn between Embertone's fantastic 'The Whistler Ensemble' and the 8Dio 'Misfit Whistle', and decided on the latter because it was exactly what I was looking for and seemed to be made simply for that purpose, opposed to a more cheery and whimsical whistle ensemble). The interface, for the most part, is pretty darn ugly (especially the harmonica). We have an amateur and hand drawn aesthetic on display here, complete with childish scribbles on post it notes. There is a help button that is definitely useful, if you can get through the clutter. I mean I didn't expect a futuristic and minimal interface on a series called Misfit, but it could have been done a whole lot better than this. However, taking into consideration the extremely low price points of each instrument, presentation doesn't matter nearly as much as the sound. Still, it's quite the eyesore. Cluttered with help info... useful, but ugly and tedious. The sound however is pretty darn good for what it's worth. I am impressed by the character they put into the samples and the different performance effects that are available. The harmonica can do straight notes and a variety of bends and trills, and I really love how it sounds. You can ever make these sound like crap and out of tune if you want (the accuracy knob displayed above purposefully makes our 'musician' blow wrong notes). This all lends well to the "quirky, drunken" nature of this Misfit instrument series. However, at this time, I don't have use for a drunken harmonica player blowing the heck out of wrong notes on an instrument that already can sound grating to the ears. The fiddle sounds really good, and truly nails that lazy western tone with amazing performance legato (which they call "true gelato") and they truly capture a raw, human quality to these instruments which is really fitting for the style I wanted to use it for. Do NOT expect virtuoso playing and a classical sound, as you get the exact opposite. These really nailed the gritty western sound I had been searching for. Highly recommended if you are in the market for some alternative and unique libraries for Kontakt or for anything in the Western genre. You are pretty much guaranteed to feel like Family Guy's Stewie Griffin in that episode where they move down south. I know I did! The only thing really missing from my ensemble so far was a great acoustic guitar. I did some live performance with my acoustic guitar and Telecaster for this piece, but I am not quite as proficient in country/bluegrass as I am in other styles, and I wanted to capture the style of finger picking, which I also am not a master at! 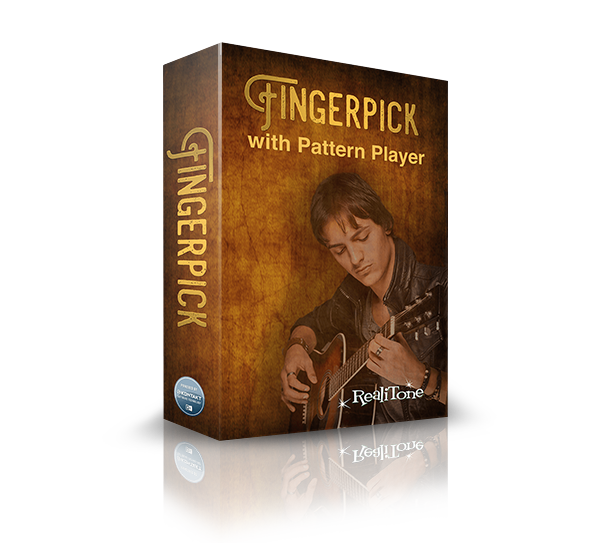 A few weeks ago, I had stumbled across something that might be able to fill this void, Fingerpick! As you may know by now I love discount plugins and samples and frequently browse and purchase from VstBuzz and Audio Plugin Deals. The latter, besides having a weekly product with an insane discount, has a shop featuring a lot of great products. You get rewards money every time you purchase one of their deals or any product from the shop. Naturally, I have accumulated a nice amount of rewards money which can go to any purchase there, so I frequently browse through to see if anything new has caught my eye. Fingerpick by Realitone is my new favorite acoustic guitar library. I was, as usual, impressed by the video walkthru and knew it was the missing spice I needed for my Western Ensemble. The programming here is phenomenal, most impressive is it's auto legato, which automatically performs hammer on's and slides depending on the length of the note on your DAW's midi sequencer. The sound is incredibly realistic and genuine, and absolutely nails the sound of a seasoned guitarist performing on your tracks. For $89.95, plus additional discounts with rewards money from the Audio Plugin Deals Shop, this library is an absolute steal. Of course it is not only suited for the Bluegrass/Western style I was looking for, and while I think it is best for Rock/Folk and Blues/County, it absolutely covers any genre of music that uses an acoustic guitar. NOW! Let's hear these bad boys in action. Giddy-Up!